As discussed in Build day 7, in had become apparent over the storms of the winter months that wind loading might be an issue on the structure. The wind loading of the dish has been well documented by the suppliers, RF Hamdesign, and by our Science officer Sam Morrell in this article. However, Ken raised a number of issues regarding the structural integrity of the telescope stand itself which was a relative unknown. I March 2016 we set about the redesign of the telescope stand. The telescope is formed of two main components: the main pillar and top plate. The main pillar is a 2.3m cylindrical hollow steel pillar that has been 3/4 filled with dry sand for the purposes of damping the vibrations and adding extra ballast. The base of the pillar is bolted to a substantial concrete foundation. The top plate a is much thinner steel tube of height 73cm, on which the telescope rotor is mounted. The top plate and the pillar are connected by a series of 12mm screws and nuts. At it’s peak the telescope would have been a whooping 3.25m high. 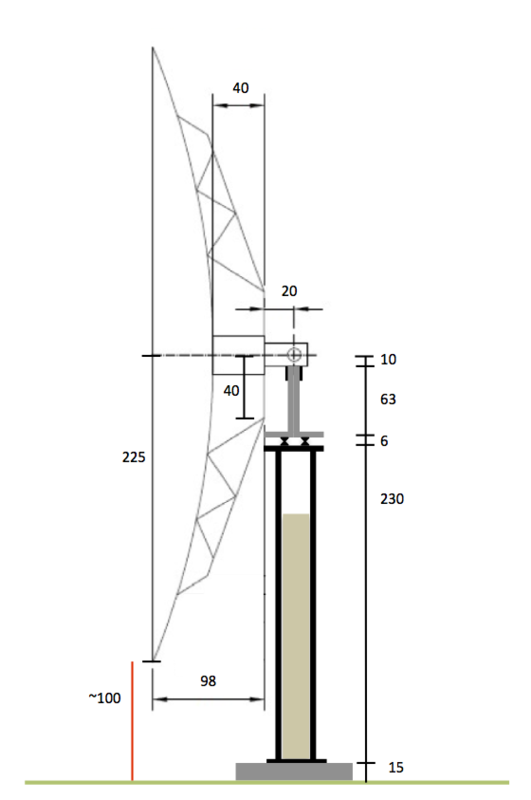 The initial telescope structure can therefore be described by the following schematic. Ken wrote to us, asking to dismantle the existing stand and cut 1m out of the pillar. This proposal initially caused some degree of alarm amongst the team. However, Ken’s many years as a professional engineer and first hand experience of the windy conditions on site convinced us this adjustment was necessary. Further more Ken assured us he would be able to carry these out without any direct involvement or cost to the project. However, as the XRT-C team looked into the problem a number of additional areas for concern arose. Our engineering team concluded that the structural weakness so not just at the base of pillar, which endured the greatest moment due the force of the wind. But it was also felt at the junction of the top plate and the pillar. Whereas the former was bolted to a concrete block, the later was secured but just 12 steel screws which could easily shear. 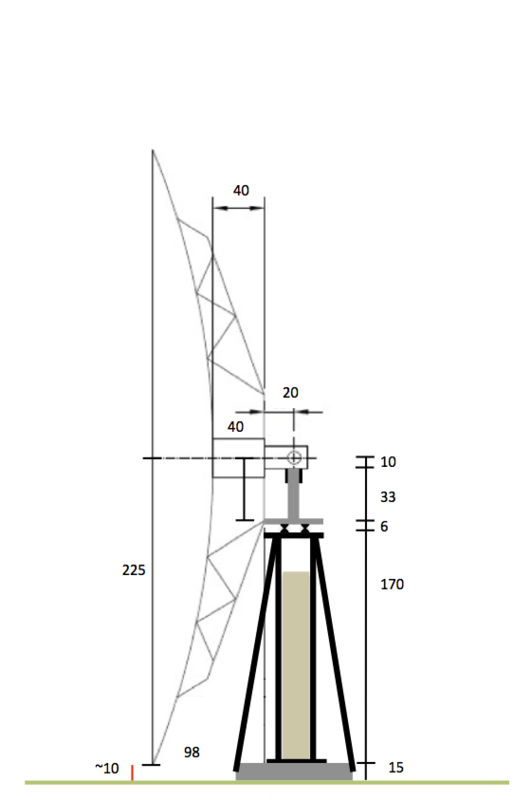 We therefore proposed for lengths to be removed from both the pillar and the top plate to reduce the moment felt by the structure in a 70 mph wind from 980Nm to 350Nm. Following further discussion with Ken we agreed that 30cm should be removed from the top plate and 60cm from the pillar. Furthermore, Ken wished to weld buttresses to the side of the pillar increase support, which were in favour of having included this in our original designs. Ken also stated his plan to remove the topsoil around the telescope to ensure that the telescope has sufficient ground clearance. Following these alterations the agreed design was as follows. Further alterations were made to the design of the top plate. Ken trimmed the corners of the edges of the flanges on both the pillar and top plate to prevent the dish catching as the telescope rotates. We also removed the adjustable screws and instead bolted and welded the much-shortened top plate to the pillar to ensure that there was no weakness in the structure. 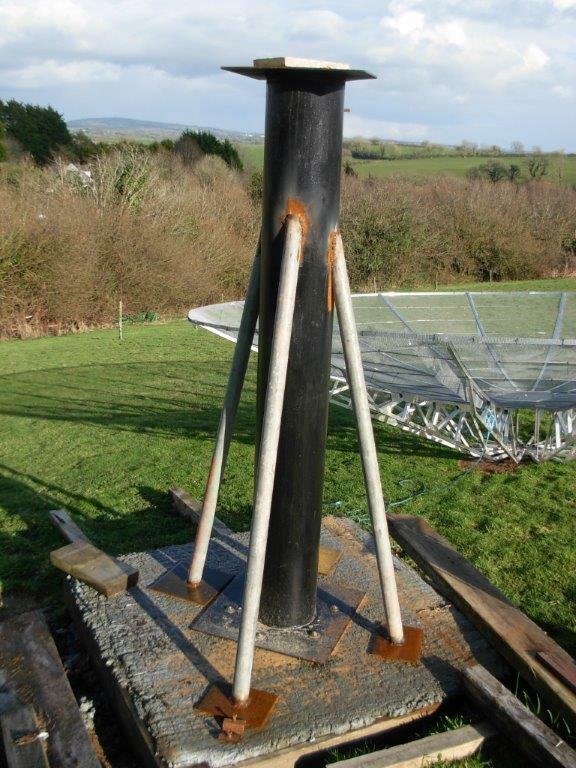 Buttresses are welded on to the telescope pillar.